After the motion poster release of Mrinal Kulkarni directed ‘Ti And Ti’ audiences were eager to see a glimpse of this film. The audience’s level of excitement due to motion poster release was evident in the response received on the social media. And hence the trailer of this film was recently released just for our audiences. Featuring Pushkar Jog, Prarthana Behere and Sonalee Kulkarni in leading roles, ‘Ti And Ti’ is an urban romantic comedy film shot in London. Who is ‘Ti’ (she)? And who gets ‘Ti’? Are some of the questions whose answers audience can find in the trailer. Each man has a ‘Ti’ in his life, who he can neither get nor forget. Same is the story with Anay (Pushkar Jog) who has two girls in his life – Sai and Priyanka. As one can get the hint of the roles Prarthana Behere and Sonalee Kulkarni will play, it will be more exciting to see what would be the next step in their love triangle. This trailer gave a surprise to the audience by revealing that Siddharth Chandekar is also playing a small role in the film. This film once again highlights the directorial skill of Mrinal Kulkarni. Filmography of the film is vivid and picturesque enough to make the audience fall in love with the film. All credit goes to Mrinal Kulkarni. Background score and songs are also increasing our excitement. 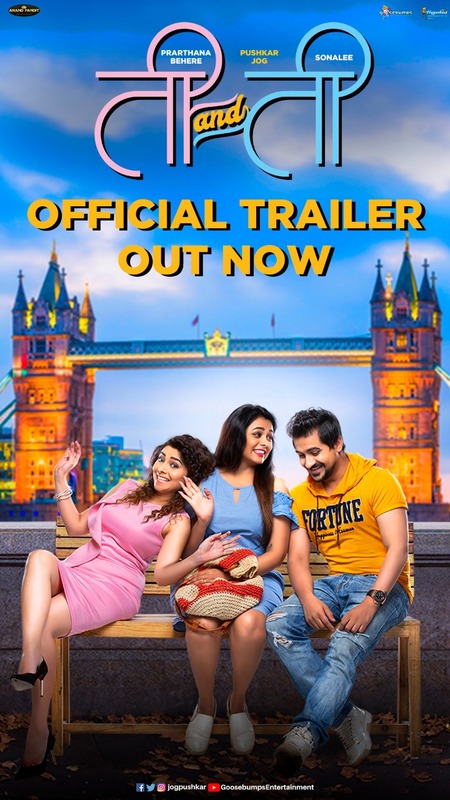 This light-hearted romantic comedy written by Virajas Kulkarni, can connect well with the new generation and is evident from this interesting trailer. Anand Pandit Motion Pictures Presents this film in association with Goosebumps and Hyperbeas. Pushkar Jog, Vaishal Shah, Mohan Nadaar are the producers and the Mohit Chhabra is the co-producer of the film. Rahul Haksar is the distributor of the film while Rajat Enterprises is handling the nationwide release. The audience can get their hands on this awesome love story ‘Ti And Ti’ on 1st March 2019.